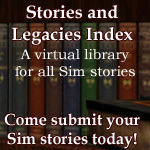 Photo Friday #32: Read Me a Story! 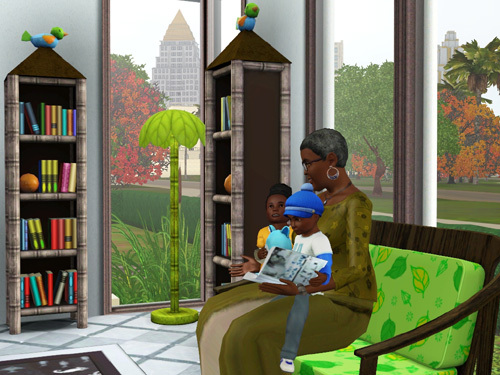 This entry was posted in Photo Friday and tagged game: Sims 3, photo: family, photo: model:female:elder, photo: model:female:toddler, photo: model:male:toddler, setting: Roaring Heights. Bookmark the permalink. 11 Responses to Photo Friday #32: Read Me a Story! This is so gorgeous ! Happy literacy day! Thank you! Though I spent my Literacy Day away from the library this year… I was on vacation, hahaha! I did get through quite a few chapters in the airport and on the plane! So true! At my daughter’s charter school, I was one of the many volunteers who helped get the library going. We sorted and sifted through donations, catalogued books, covered spines with library tape… whatever was needed. We set up and then moved it multiple times until a permanent space was made available (a log cabin that had been carefully moved from its original property and rebuilt upon the school campus). Later on, I added one more hat when I coordinated their Book Fair for several years. This quote is similar to my way of thinking. I wouldn’t guide a child to a book. I would ask them to tell me what they liked and we would find a book together and then sit down on the rug and read :) More often than not, that book would be in their arm as they headed out the door. That is one of the most important parts of doing reader’s advisory. An unskilled teacher or librarian might just turn straight to whatever is popular or a bestseller, the books “a lot of people like” instead of really zoning in on a particular patron’s needs. But once you find one book or series a person loves and get hooked on, then they’ll next time they’ll want something similar, and it becomes easier to find more books with common themes or styles now that you have one solid series they love to go off of. Watching a patron really fall in love with a book is one of the greatest joys of being a librarian! ^_^ And I don’t know how many times I was introduced to new books and series by patrons bringing books that looked interesting to my attention that I wouldn’t have known about otherwise! Awesome picture , a grandma who is reading a story for her two little children. However I am not fond of reading . You rarely see me with a book between my hands. I just don’t like reading books sorry ! It’s a real feeling not a whim as reader lovers always think of us.